My mother always told me stories about traveling to Michigan across the Great Lakes on big ships during World War II. Last summer I decided to record this memory of hers. I sat her down with my recorder and a pot of tea and took her back through those nostalgic memories. Later on, when I was transcribing the interview I had to figure out how to spell the funny names of the ships she rode on. Google has become my go-to spell checker, and faithfully it corrected my spelling of the ships: “SS Assiniboia” and “SS Keewatin.” Then I noticed a listing for www.sskeewatin.com where I learned this ship still exists. In fact, it has become a museum and is now parked in a harbor in the Georgian Bay, on the Canadian side of Lake Huron. I quickly decided a trip to my mother’s past would be in our future. Mom is delighted by her memories of "ginger ale" in the water. 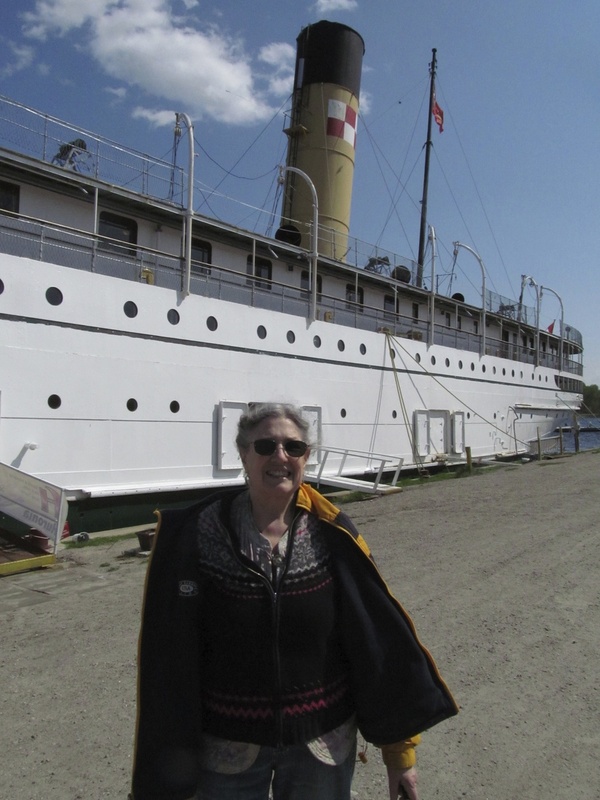 A week after Mother's Day my mother and I boarded the SS Keewatin, a majestic mini-Titanic, built in 1907. The one-hour adventure on this docked boat was so exciting for both my mom and me. Her eyes shone with glee. She leaned over the railing and pointed, “This is where I used to watch what my mom always called 'ginger ale,'” referring to the bubbly water created by a ship's wake. She rang the bell on the deck. A woman on our tour gushed to mom, "I'm so jealous you got to take this boat back then." Our guide led us through the long hallways, ballroom, dinning room, decks, and curving staircases, while mom's memories grew brighter and stronger. 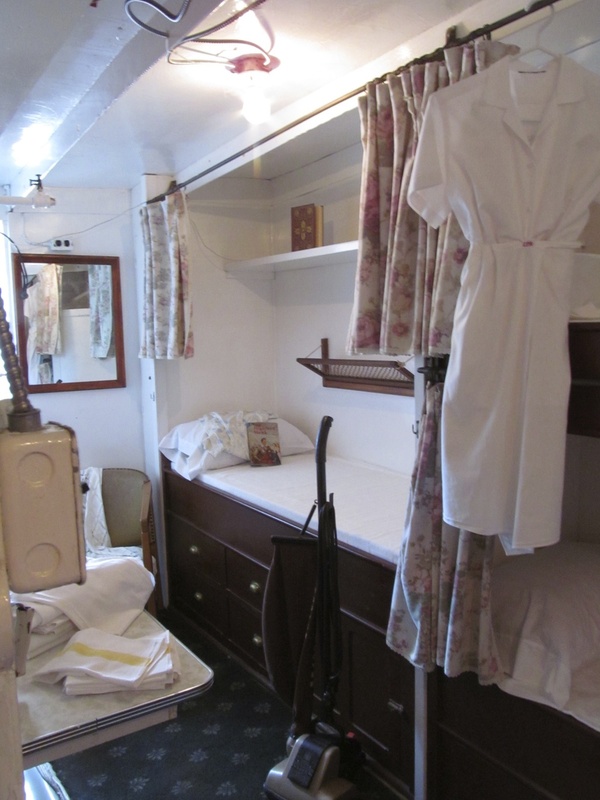 We saw inside the places she never had access to, such as the kitchen, crew quarters, and deep in the hold where four giant boilers once turned coal into steam energy to propel the ship. Here is my mother’s story of her summer travels on the great ships of the Great Lakes. We always went to the UP, the Upper Peninsula of Michigan, to visit grandparents during the summers of my childhood. It was special because it was a long trip from Worcester, Massachusetts to the UP. During World War II they used to give people ration stamps for gas, and there were never enough for a long road trip. So my father, in order to save up enough gas rations to make this trip, would drive part-way to his work, park the car, and walk the rest of the way. Dad also found we could save on gas rations by driving through Canada. At the Niagara Falls Escarpment my father used to tell us all about rocks, and minerals, and the formation of the escarpment. It was interesting, but it sort of went in one ear and out the other. If I could do it again I would listen so intently, because he had so much to tell us. The best thing my father found for saving gas rations was a boat. In Port McNicoll, Ontario we always boarded one of the twin ships, either the SS Assiniboia or the SS Keewatin. It was an overnight trip on Lake Huron and we would stay in one of the staterooms on the ship. We did so much on those cruises. My older brother Jim and I were given free run of the boat. We played shuffleboard and went places we probably shouldn’t have been. I remember the engine rooms. On the top deck they had glass windows that you could actually look down and see the ship’s engines, which is what piqued my older brother’s curiosity. He was determined he was going to get into that engine room, and we did, very briefly. We opened a heavy door that said “Do Not Open.” We quickly were discovered and shooed out. We really had a wonderful time. Dinning Room on the SS Keewatin. Notice the chairs and tables are bolted to the floor. In the evening we had dinner in the dining room seated at tables with beautiful white tablecloths and heavy hotel silverware. It was elegant. The seats and tables were all bolted to the floor so they wouldn’t shift as the boat heaved on the water. After dinner my mother, with dad’s encouragement, would sit down at the piano in the ballroom and play and everyone would listen. Usually we ended up singing, and within an hour there would be a crowd of people gathered around my mother. She was a beautiful pianist, classically trained, and she could also play by ear. You could hum any song to her and she could play it. She was amazing. We got off at Sault Ste Marie (pronounced Soo Saint Marie), just before the ship would go through the Soo Locks. Before taking off in the car we would wait and watch the ship pass through the locks. Instead of a waterfall they have locks to regulate the levels of water so that the ship can go up or down slowly and into the next lock, and then again into the next lock. That was tremendously interesting. There was something magical about walking around on this ship of my mother’s past. I knew her story better and I could see it. I could imagine my mother and uncle sneaking into the engine room. I could almost hear the echoes of my grandmother playing the piano in the ballroom, and the laughter of my mother and her siblings as they played shuffleboard. I shared the pride my mother felt at her father’s bright idea to save gas for this trip. I felt the love my grandparents had for their children, and recognized how important this trip was to them to maintain their family’s connection to their roots in the Upper Peninsula of Michigan. 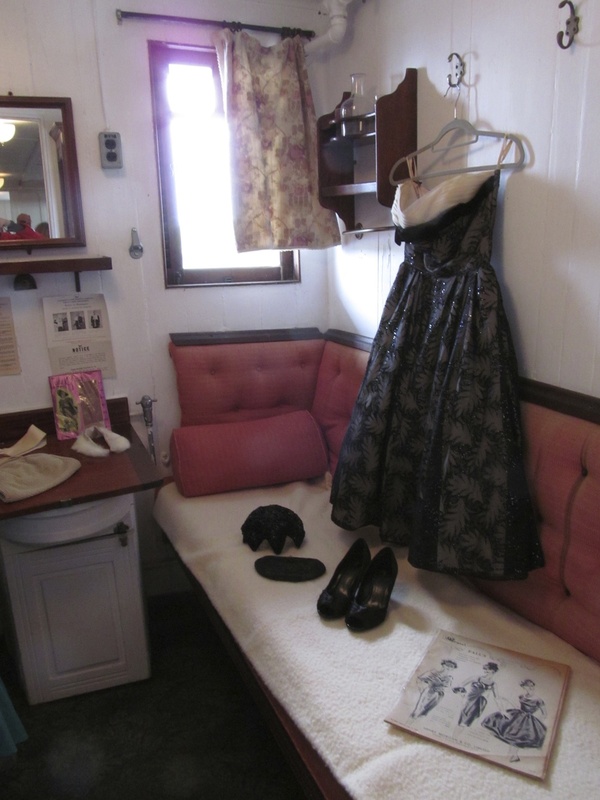 Because of her story and our visit to the SS Keewatin I feel connected to my mother’s memory. If you have an opportunity to go to the places of your memories, do. Better yet, bring along your child or grandchild. Return to your hometown. Visit your elementary school. Knock on the door of the home that was once your grandparent’s. Walk in the field where you played baseball. You may find that things have changed, but memories will always linger there informing you of what once was. Let these places bring you back, reminding you of where you have been, how far you have come, and perhaps, if you listen, they will also lead you to where you need to go next.